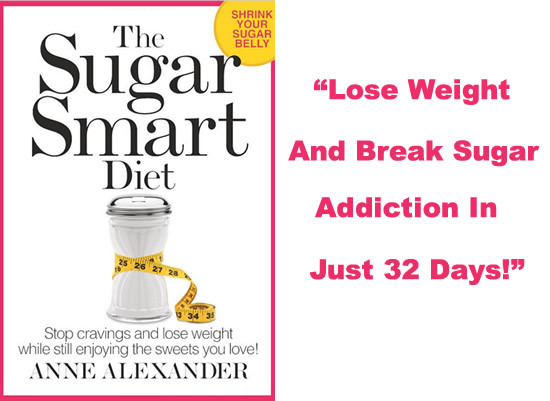 The Sugar Smart Diet is a 32-day plan designed to gradually wean you off obvious and hidden sugars and refined carbs. The program was created by Anne Alexander, who is the editorial director of Prevention magazine. Most people are eating far more sugar than they realize because sugar is often hidden as an ingredient in food. The average American consumes 130 pounds of added sugar every year, not including the sugar naturally present in food. The Sugar Smart Diet helps you identify these hidden sugars in your diet and gradually wean you off sugar. You then learn how to include sugar in your diet in a healthy balanced way. Firstly you will assess your current intake of sugar and refined grains and gradually eliminate them. Within 72 hours you begin to transform your physiological and emotional connection with sugar and reduce its harmful effects. This phase removes all sugar – even fruit – from your diet. You are not allowed any processed, refined or whole grains. Most dieters lose an average of 4 pounds by day 11. On day twelve you will reintroduce fruit. You can also have one serving of low sugar whole grain bread per day. In this phase you are permitted 1 teaspoon of honey or pure maple syrup a day. You are also allowed to eat whole grain pasta and bread once a day. In the final part of the diet you will learn how to enjoy sugar in moderation. Each day you are allowed 6 teaspoons of added sugar. The meal plan includes extra treats containing no more than 3 teaspoons of sugar. You can continue to eat fruit. You are also allowed to consume processed grain products once a day. Chicken breast, tuna, salmon, grass-fed beef, eggs, nonfat yogurt, skim milk, whole wheat pasta, whole wheat bread, oatmeal, lentils, black beans, quinoa, hummus, natural peanut butter, walnuts, broccoli, arugula, asparagus, cauliflower, butternut squash, potatoes, blueberries, pear, avocado, chia seeds. The Sugar Smart Workout combines cardio exercise, strength training and yoga. You will devote 45 minutes to exercise – six days a week – but you can break it into 15-minute sessions throughout the day. If you don’t want to follow the Sugar Smart Workout, any physical activity you enjoy will help get sugar off your brain and belly. If you would rather do brisk walking, tai chi, swimming, cycling, yoga or gardening that’s fine. The Sugar Smart Diet: Stop Cravings and Lose Weight While Still Enjoying the Sweets You Love! retails at $26.99. Identifies hidden sources of sugar in your diet. Helps eliminate cravings for sugar and refined grains. Can improve blood sugar balance, cholesterol and blood pressure levels. Sugar Smart teaches you how to enjoy sugar in moderation without negative effects on your weight or health. Includes a meal plan and low-sugar recipes. Discomfort may be experienced during phase 1 when all sugars are completely eliminated. Some dieters may have difficulty controlling their sugar intake once sweet foods are reintroduced to the diet. May be necessary for some people to avoid sugar completely to achieve their desired health outcomes. The Sugar Smart Diet is designed to help you make peace with sugar and banish cravings from your life forever. It eliminates hidden sugars from your diet and resets your sweet tooth so that you can enjoy sugar in moderation.